The forest ecosystems around the Quabbin Reservoir provide clean drinking water to more than 2 million residents of metro Boston and western Massachusetts. Credit: Clarisse Hart. All land is not created equal. Some ecosystems do triple duty in the benefits they provide to society. Massachusetts forests, for example, filter public drinking water while also providing habitat for threatened species and storing carbon to combat climate change. Ecologists and conservation groups single out the hardest-working ecosystems—called "hotspots"—for their exceptional conservation value. A new study published today in the Journal of Applied Ecology reports that the number of ecosystem hotspots has increased in Massachusetts over the past decade, with more and more hotspots popping up in metro Boston. But, the study authors say, more hotspots may not be a good thing. Jonathan Thompson, a senior ecologist at the Harvard Forest and co-author of the study, attributes the increase in hotspots to a degradation of ecosystems across the Commonwealth: "Over the past ten years, urban development has increased by more than six percent, at the expense of forests and agricultural lands. When we lose intact forests, we lose stable flows of clean water, climate regulation, recreation opportunities, and wildlife habitat. The remaining forest is left to pick up the slack." Meghan Blumstein, lead author of the study and a doctoral student at Harvard University, notes that the emerging ecosystem hotspots are highly valuable and indeed worth saving. But, she adds, "An increase in their number reflects an ongoing division of the natural landscape into smaller units, which are expected to produce the same number of services with less." "Humans have used the land for millennia to satisfy particular needs," says Saran Twombly, lead program director for the National Science Foundation's Long-Term Ecological Research Program, which funded the research. "This study takes a broad view to show that exploitation of land for one use has effects on a wide range of services we expect the natural environment to provide." Using satellite maps, the research team tracked changes in land cover—such as forest clearing for agriculture or development—across Massachusetts from 2001 to 2011. In each 30-meter square on the map grid (about the size of 2 basketball courts) they applied computer models to assess which benefits each ecosystem could provide, and how those benefits changed over time. The research team found that some benefits, like wildlife habitat for ground species, declined state-wide over the study period. But benefits like carbon sequestration and outdoor recreation increased, because intact forests are growing rapidly, and more land is being conserved and made available for outdoor recreation like hiking and hunting. For some benefits, the scale of the analysis made a big difference, says Blumstein. When analyzed at a local scale, an area of forest in the Quabbin Reservoir may appear to be less of a hotspot than a local park. 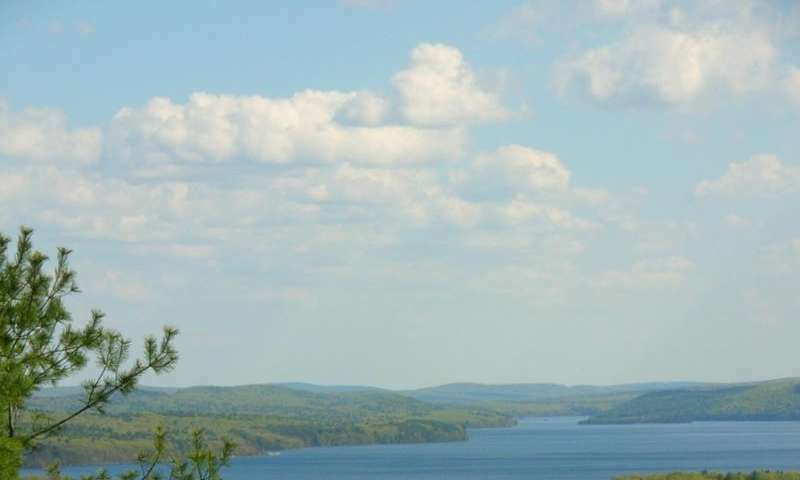 But when analyzed at a regional scale, the continuous forest area around the Quabbin Reservoir provides clean drinking water for millions of Massachusetts residents. The scientists say they hope the research will encourage collaboration in the conservation community. "The sustained delivery of benefits from nature requires an approach that considers conservation at multiple scales," says Blumstein. "The natural environment cleans our water, shelters our wildlife, mitigates climate change, and protects us from flooding," says Emily Bateson, program coordinator for Wildlands and Woodlands, a conservation initiative that calls for the region to conserve 70 percent of the New England landscape as forest. "Here is another resounding wake-up call that we must redouble our efforts to conserve the natural landscapes that sustain us all." Wildlands, Woodlands and the so called hotspots are not species' forest terms. They are coined to justify forestry triage where each forest has a people use. They are not, nor will they ever be, proper terms to describe the natural landscape. Best for the environment is a specie' forest or species' grassland. A species' forest is of, by and for all the other native plants, animals, fungi and soil microbes that have occupied that place. It is sad that Harvard ecologists do not see this. It is sad that they use forestry and resource industry terminology. The term wildlands is for hunters. A species' forest is not wildlands. It is the species' forest. The Quabbin Reservoir is not being allowed to return to a dynamic equilibrium of very old trees. These university schools of forestry, the Commonwealth of Massachusetts and industry conspire to block the return of the species' forest at the Quabbin Reservoir and they have created their own slang to do this.